You can warn the user on sunburn or detect the UV index. 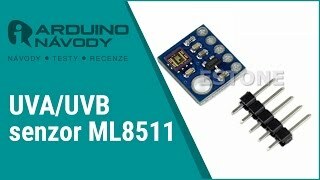 ML8511 is an easy to use sensor of ultraviolet light. The output is an analog signal of a magnitude depending on the amount of UV radiation that is detected. This sensor detects 280-390nm efficiently as possible. It is categorized as part of the UVB spectrum, and most of the UVA (tanning rays) spectrum. The output analog voltage that is directly proportional to the measured UV intensity (mW/cm2). Dimensions:13mm x 11mm x1mm.